Weigh these important considerations before shelling out for this favorite flooring material. Natural texture, super strength, stain resistance, and blend of vibrant hues are all reasons that slate tile—the thin, uniform-cut sheets of metamorphic rock—ranks high on the wish list of flooring choices. But as far as a rigid flooring product goes, this sought-after material isn’t suitable for all homes. If you’re considering installing slate floors in the kitchen, bath, mudroom, or patio, first consult our guide so that you have a better idea of what to expect out of the material. 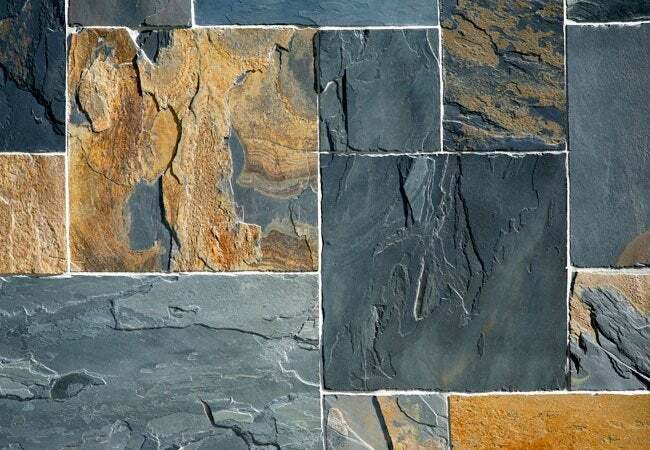 Known primarily for its charcoal hue and grooved texture, selecting slate for your interior or exterior flooring opens a much wider variety of choices in terms of shade and pattern. This stone boasts texture in both coloring—which can include mixtures grays, tans, rusty browns, olive greens, and even specks of purple and cyan—as well as contouring. 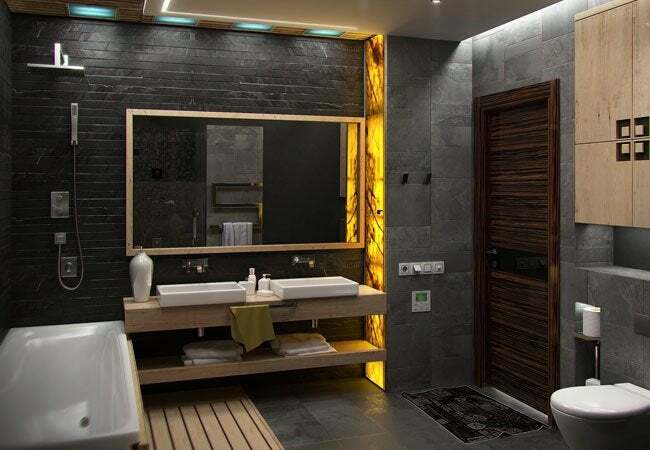 You can keep it more natural by embracing the physical texture (and enjoy the added bonus of some slip resistance), or opt for slate tiles that have been sanded smooth. No matter your preference, all variations on the earthy material effectively bring the outdoors in wherever homeowners choose to incorporate the stone. Their creation also contributes to the strength of the surfaces. Forged from natural minerals like quartz and calcite in extreme heat, slate is an extremely durable and solid surface that withstands everyday wear and tear. If you do accidentally drop something heavy and chip the floor, you won’t see quite a contrasting color difference as you would with ceramic or porcelain tile. One caveat: Slate is slightly softer than some other stones, so it scratches relatively easily. This makes it an unsuitable choice for floors subject to heavy abuse, like those within a garage or warehouse. However, slate remains a great choice for kitchens and bathrooms. 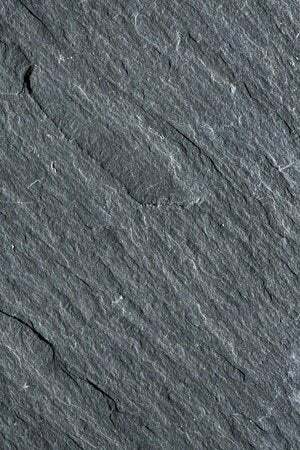 Like other natural stone flooring, mined slate is a costly investment to purchase and install within the home. Experienced do-it-yourselfers can save a substantial amount of money by forgoing a call to the professionals and laying the floor on their own, leaving the bulk of the budget for the cost of materials themselves. These stone tiles range in price depending on how much effort was required to quarry, from around $2 per square foot (stone mined closer to the earth’s surface, and therefore easier to acquire) to as much as $10 per square foot (often a higher-end stone that is mined underground)—still a fair amount less than the price for marble or granite flooring. If you do choose professional installation, know that the materials are the least expensive part of the cost of your new slate floors. The cost of labor typically runs two or three times the price of the tile, because the contractor has to prepare the substrate in multiple layers. Thoughtful patterns in the tiled floor will also increase the bill. Before you commit to slate tile, take a closer look at your floor system to be sure it is adequate to handle the new flooring. Slate is both heavy and brittle, so sponginess or bounce in your existing floor could result in cracked or popped tiles—not at all what you want to see in such a big investment. Your floor system, which consists of the framing and the subfloor, must be structurally sound and rigid enough to support the heavy weight of the slate tile. Both stick-framed and manufactured floor systems might require reinforcement and/or stronger underlayment before you can install slate tile. To be on the safe side, have an engineer or the inspector for your local building authority, assess your floor system and make recommendations, if necessary, for beefing it up before installing tile. As mentioned earlier, installing rigid slate floors is a pricey professional job because it’s an involved process—this challenge may not be for the faint of heart. Should you choose to install the floor yourself, be sure to stock basic carpenter hand and power tools in addition to some specialty tools, such as cement board clippers and diamond blade for your circular saw. A wet tile saw will make cutting the slate simpler and far less dusty. You may also wish to buy or rent a hand-held oscillating saw for undercutting the bottoms of doorjambs and casings so you can slide the tiles beneath rather than having to notch around them. Your slate floor will be only as good as the substrate beneath, which must be rock-solid. Five individual layers are necessary for a structurally sound slate floor. From the bottom, the layers consist of: the subfloor, thin-set mortar, cement backer board, another layer of thin-set mortar, the top layer of slate tile. Installed correctly, the substrate is optimal and the floor will last for many years. Grouting between slate tiles on the top-most layer is generally completed after the thin-set mortar sets. Since slate is slightly porous, it’s a good idea to apply a penetrating stone sealant to the tiles before grouting. Otherwise, bits of grout that get on the tile in the next steps could be very difficult to remove and mar your otherwise sophisticated surface. Overall, homeowners who choose slate will be happy to know that this high-style flooring material is relatively low maintenance. Though the dark and textured surface won’t quickly reveal tracked-in grime, a quick daily sweeping with either a broom or dry mop will eliminate its most damaging culprit: dust and dirt. Left to collect for weeks at a time, these particles might scratch the soft stone. Beyond the five-minute sweep on a daily basis, you’ll want to schedule a deeper clean every few months. Simply mopping up slate floors with a sudsy mixture of warm water and mild dish detergent, a neutral pH floor cleaner, or a solution designed specifically for use on stone and tile should prevent any oily build-up from exposure to kitchen grease or bare feet. And make short work of any spills by resealing twice a year: Keeping in mind that this surface material is indeed slightly porous, mop or roll on a good slate sealer in order to prevent spills from seeping into the stone and staining.